Nespresso is still a beautiful model | Business Models Inc.
understand. And people love to talk about it. I often use Nespresso in our training courses and client strategy workshops. But what is so special about the Nespresso model? I think that people do not realize that it took Nespresso 30 years to get where it is now. Their patent was registered in 1976 and it was launched internationally in 1991. George Cloony – very strong connected to the brand – was hired in 2006. For me there are on a high level 2 elements of the business model that are remarkable. 1. Nespresso uses different channels to distribute to their clients. Except for the easiest channel: the supermarket. Where nowadays we see supermarkets are becoming more powerful than the production companies such as Unilever and Proctor & Gamble, Nespresso is able to pass the supermarket channel. 2. Nespresso knows everything about his clients. Amazing. They connect you through their Nespresso club and they make it work. An example I experienced myself. I got a second hand machine from one of my clients and I tried to order cups. A callcenter called me and registered all my information. “What is your machine ID?” they asked. “Mmm… that is not your machine isn’t it? It is from 72dpi! Wow! Last month I bought my own machine as the other broke down finally. Their service in the shop was excellent. I took home a huge pack of all kind of coffee flavors. Yesterday I got a phone call from Nespresso club. “How are you, do you like our product?”. Yes I said but at the moment I try to drink the less favorite blends. “No problem” she said. “Just serve it to your guests!” “And… can I help you with ordering the new blends then?” Fantastic. This is service in optima forma. I love it. That’s why I love to use this example. A lot to learn from Nespresso. Do you want to read more about this case study? 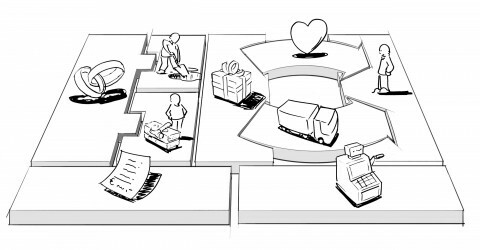 On page 236 of Business Model Generation you can read all details and their next business model! The visualization was made by Xplane. 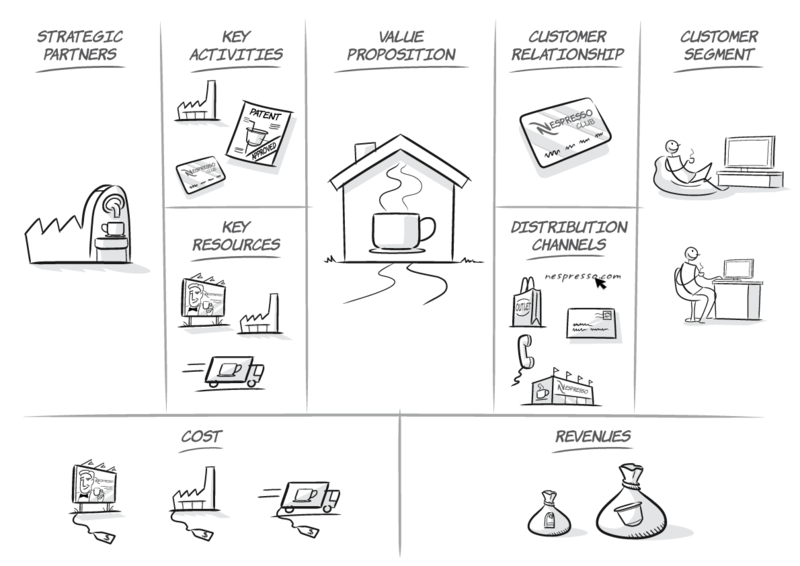 Business Model Presentation in 7 minutes… Visualize your business model! Why? Subscribe to Business Models Inc.
Visualize your business model! Why?